The Plan Why Us Latest News! As the 2018 midterm elections approached, our volunteer army registered 6,000+ Democratic voters in the 5 swing districts of Southern California — helping flip ALL 5 districts and win Democratic control of the House. And now we’re going national. In 2020, we’re coming for the White House, Senate, and more! Positive human interaction. It wins elections! We connect with people in real conversations. We listen to their concerns. And then we not only register them to vote — we educate them too, so they know what to do with that vote. Just sign up for an event! No experience necessary! Every event starts with a fun 15-minute training. If you’re new, we’ll pair you with a seasoned pro. Then we’ll give you a clipboard, pens, and the sacred registration forms, and deploy to a “hot spot” where we’ve had success before. Time to shine! You’ll talk to a whole lot of people — register as many as you can — and return to base camp a conquering hero! 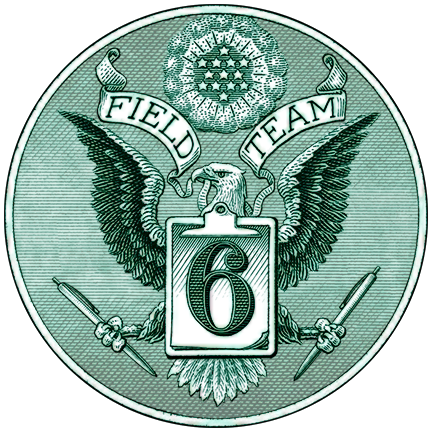 Paid for by Field Team 6, fieldteam6.org, not authorized by any candidate or candidate’s committee.